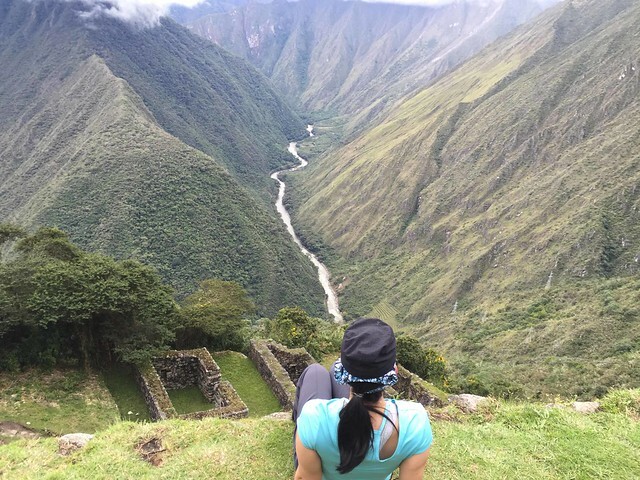 “You’re a marathon runner so you should be fine.” That was always the first reaction that I got whenever I told people that I was going to hike the Inca Trail. To be honest, I wasn’t as convinced that being a runner would help. The conditions were just so different from my regular running conditions. My main concerns were the altitude (going from sea level in Toronto to hiking up to 4,200 metres above sea level was a big concern for me) and the actual climbing (uneven stone steps made out of rocks and going up and down mountains). As someone who is used to pushing myself physically I was also worried that I’d take this approach and overdo it on the trail. It turns out that being a marathon runner did help after all, but not in the ways that I expected. 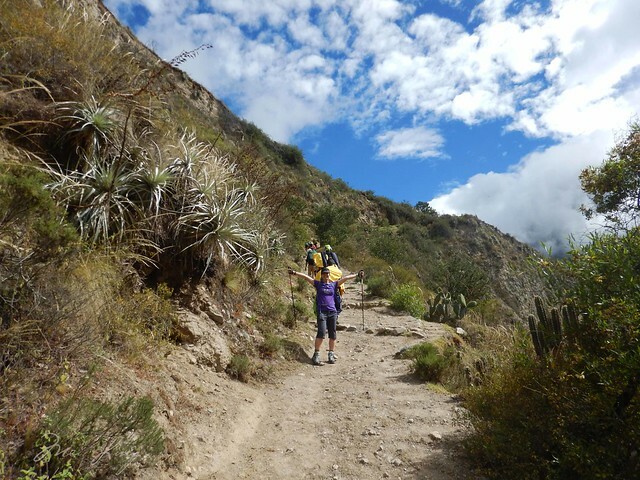 The Inca Trail is challenging, and like running, a big component of the challenge is mental. There were many points on the trail where it felt like an endless ascent. You would climb a set of stairs, huffing and puffing and taking breaks as needed. When you got to the top you would turn a corner only to discover that there were even more stairs and that you had to start the process over again. On day two, which is also infamously the hardest day, when we climbed Dead Woman’s Pass it felt like we’d never make it to the summit. In fact, I found that it actually got even harder when I could see the top. It looked so far away and my progress didn’t match my effort. I felt like it would never end. This is where my long distance running training benefited me the most. I can’t even tell you the number of times I’ve been running and just wanted to stop, give up or turn around and go home. Running is truly mental and I’ve had a lot of practice training my brain to think positively and get to the next mile marker (or set of stairs) until I reach my goal. I also thought back to all of the hill training and races that I’ve completed and told myself that if I could get through those that I could get through the Inca Trail too. I even treated the summit of Dead Woman’s Pass like the end of a race. As I approached the top I pushed myself even harder and let out a yell of excitement as I took my last step to the summit. It felt just as incredible as finishing a race and I (literally) jumped for joy. Literally jumping for joy at the summit of Dead Woman’s Pass. Finally, when I’m running I find inspiration in others running past me. In this case, the porters were incredibly inspiring. They were running up and down the trek carrying packs that are four times the size of my backpack. They were incredible and some of them would shout words of encouragement to me as they went by. Like the spectators cheering you on at a race, I used these porters to give me a boost and keep me going. 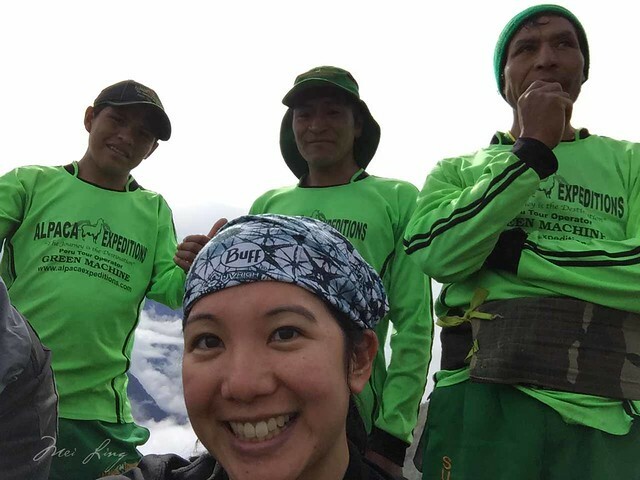 Selfie with some of our awesome porters. They were amazing. Another benefit of running long distance is that it has helped make me physically tough. My body is used to getting beat up. I still found the trek challenging, but I didn’t find it as difficult as Dan. I found that I was able to adapt quickly and get into a good walking rhythm, similar to when I’m running. When I trained for my first marathon, I learned how to hold my pee while running and this skill came in handy on the trail. 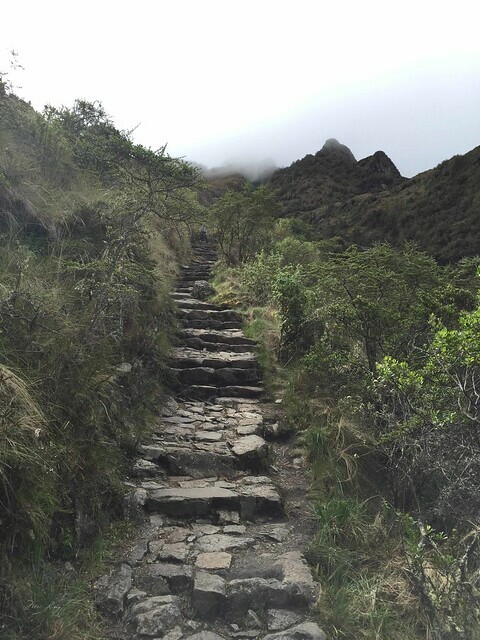 As with marathon training, there isn’t always a washroom nearby (or even a nice wooded area) to go if you need to pee when you’re hiking the Inca Trail. On day 2, I reached a point on our second descent when I felt like I had had to pee for a while. I was by myself with nobody in sight, but there was nowhere to go relieve myself. On my left was the mountain side and on my right was cliff. If I just peed on the trail, I ran the risk of somebody turning a corner and seeing me. After a while it felt like I was never going to reach the bottom and I wanted to cry. Instead, I took a deep breath, thought back to my marathon training, and made it to the camp. As with running, it also turns out that I didn’t have to pee that much at all. Once again, it was all in my head. Relaxing at Intipata, one of the Incan ruins that we visited during the trek. The final unexpected benefit of running long distances was my ability to recover quickly. We hiked a total of 45 km up and down steep rocky steps over the course of four days. In the end, I didn’t feel sore or tired at all. I felt fine. During one of the descents, Dan and a few others in our group complained about having sore quads and calves. I happily told them that I wasn’t sore at all (I wasn’t anybody’s favourite person at that moment!). I was pretty impressed at how quickly I recovered from the trail, especially since I’m not much of a hiker. I should add that I recover very quickly from races. I don’t feel sore after running half marathons and I’m only mildly sore after 30 km. I didn’t always feel this way. I could barely walk after my first ultimate frisbee game and my first 12 km race. I needed help getting up from a sitting position following my first half marathon. The more I ran, the more my body got used to it, and the less sore I felt. 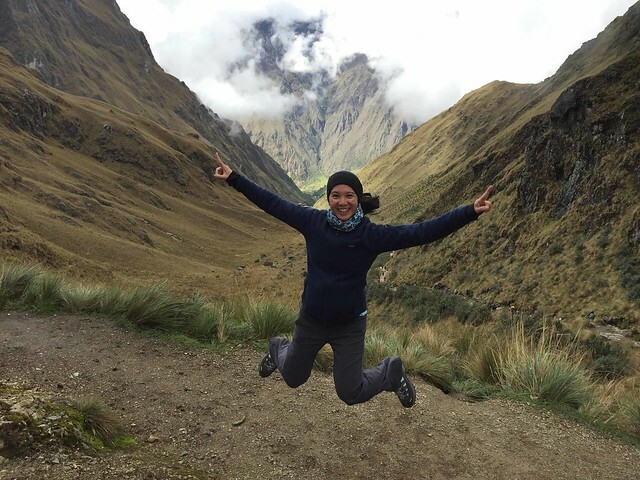 I’m glad I put in all of those hours running, because it made my recovery from the trail much easier and I was able to enjoy the rest of our trip to Peru pain-free. Meanwhile, poor Dan (who has been recovering from a running injury for the last 1.5 years) suffered a lot more than I did. It’s been a little over two weeks since we got back from our trip, and just over three weeks since we finished hiking the trail, and I think he’s finally recovered. Being a long distance runner definitely helps! 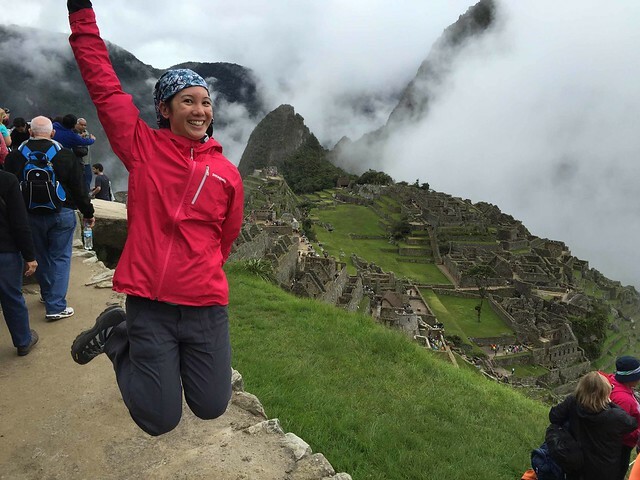 I still had enough energy to jump for joy at Machu Picchu! I remember Dead Woman’s Pass! The Gringo Killer was pretty “fun” too. Great post Mei, you worked hard training all winter so glad you got the benefits on your Peru adventure. You’re posts will be in my “Reader” now that I have a WordPress 🙂 Should be posting something early next week.